Chrome Plated Brass Angle Valve For Connecting Interface , 1 / 2" x 1 / 2"
Large Image : Chrome Plated Brass Angle Valve For Connecting Interface , 1 / 2" x 1 / 2"
Suitable for connecting interface. Slow-open switch. 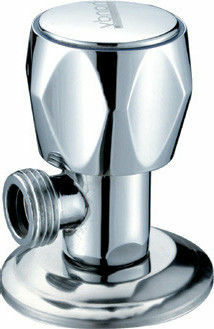 High purity brass main body, chrome plated. Ceramic cartridge,Quality guarantee time:5 years no leakage.